Transnational corporations have become central organizers of economic activities and major actors in shaping the international division of labour. They perform this role through foreign direct investment as well as a variety of non-equity relationships with host country enterprises. The World Investment Report 1992: Transnational Corporations as Engines of Growth to be released on 15 July 1992 by the Transnational Corporations and Management Division of the United Nations Department of Economic and Social Development—the second in this annual series begun last year—provides an analysis of the impact of transnational corporations on the economic growth of developing countries and related policy issues in both the national and international domains. The major highlights of the Reports findings are summarized below. By 1990 the total number of transnational corporations exceeded 35,000, with more than 150,000 foreign affiliates. This growth in numbers has accompanied a massive outpouring of foreign direct investment during the second half of the 1980s. The total stock of foreign direct investment world-wide now stands at some $1.7 trillion, with annual flows in 1990 amounting to $225 billion. The global sales of foreign affiliates of transnational corporations are estimated to be some $4.4 trillion, far greater than world exports estimated at $2.5 trillion, excluding intra-firm trade within transnational corporations. Sales by the affiliates of transnational corporations have thus emerged as a far more important mode of serving world markets than trade. In recent times foreign direct investment flows grew fast not merely in terms of absolute magnitude, but also outpaced a number of other economic flows. 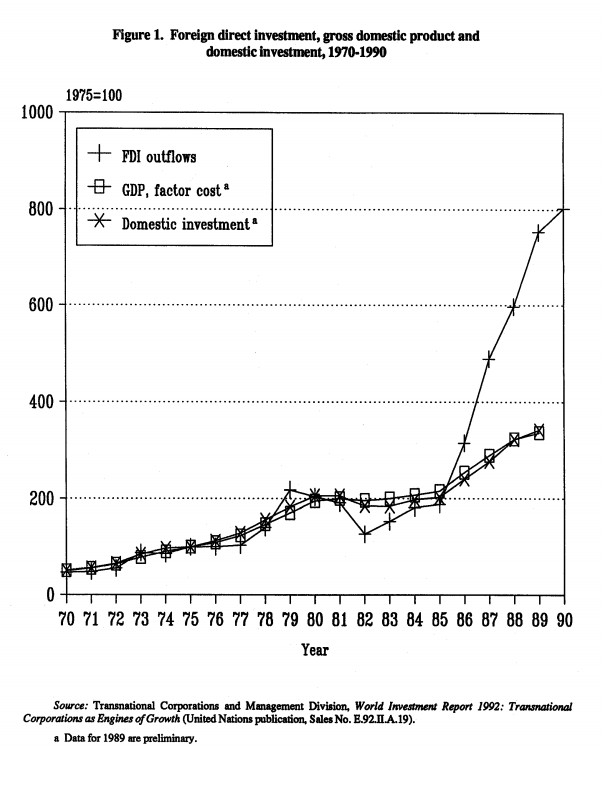 During the second half of 1980s, global foreign direct investment flows grew four times faster than domestic output, twice as fast as domestic investment, two-and-a half times as fast as exports and one-and-a-half times as fast as technology payments (as measured by royalties and licence fees) (figure 1). Developed countries continued to attract more than four fifths of world-wide foreign direct investment inflows in 1990. The Triad, consisting of the European Community, Japan and the United States, accounted for 70 per cent of world-wide inflows. With the greater integration of non-European Community Western European countries, the European Economic Area (EEA) comprising countries belonging to the Economic Community and the European Free Trade Association, is emerging as a powerful economic region. 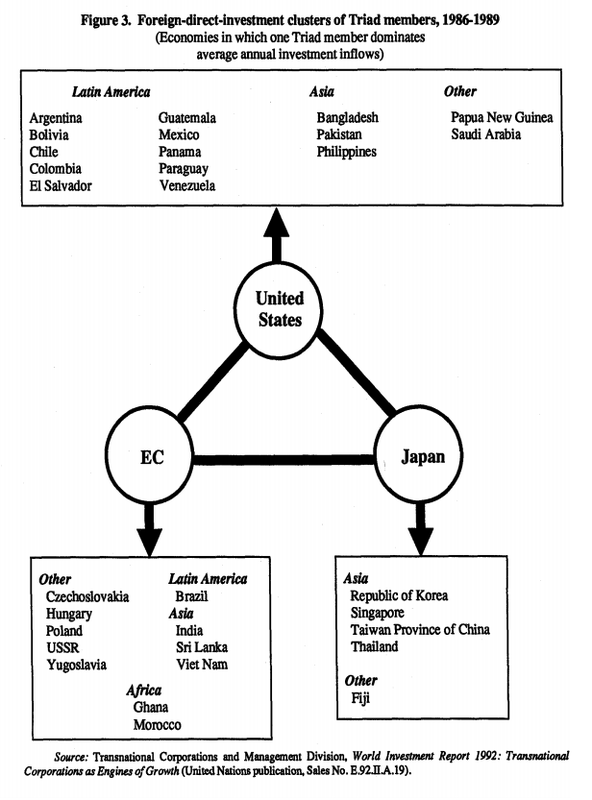 In the 1990s the emerging triad may be more aptly described as including Japan, Nordi America (Canada and the United States) and the EEA. 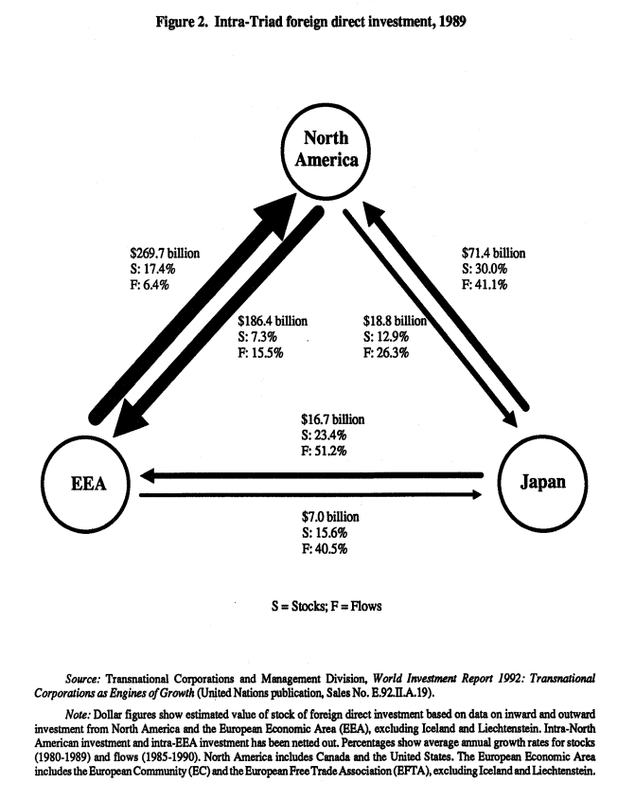 Cross-holdings of stocks of foreign direct investment within this emerging Triad amounted to $572 billion in 1989 (figure 2). Central and Eastern Europe is also likely to assume an increasing importance as a host region for foreign direct investment. The number of joint ventures and wholly-owned affiliates registered in this region doubled between the beginning of 1991 and January 1992 to reach a total of over 34,000, involving foreign equity commitments of over $9 billion. The amounts actually invested, however, remain small. With improvements in political and economic conditions, cumulative foreign direct investment flows to the region could rise to exceed $50 billion during the 1990s, an estimate based on standards of foreign direct investment flows to Brazil, Mexico and Portugal in the 1980s-countries with similar per capita levels of gross domestic product as the Central and Eastern European region. WHERE DO DEVELOPING COUNTRIES STAND IN RELATION TO FOREIGN DIRECT INVESTMENT? The absolute volume of foreign direct investment flows to developing countries has continued to increase, reaching a total of $32 billion in 1990. But their share in world flows has maintained a downward trend, declining from 25 per cent in the first half of the 1980s to 17 per cent in the second half. Despite a declining share, the rate of growth of foreign direct investment flows to developing countries was more than twice the rate of growth of domestic output, investment and technology imports of these countries and one-and-a-half times the rate of growth of their total imports. However, the distribution among developing countries continues to remain highly uneven. In 1990, the Asian region claimed the lions share with about two-thirds of total flows to developing countries, Latin America remained a distant second with less than one-third, while Africa received about 7 per cent, and least developed countries as a group had access to less than one per cent. During the period 1980-1990, the ten largest host economies (Argentine, Brazil, China, Egypt, Hong Kong, Malaysia, Mexico, Singapore, Thailand and Taiwan Province of China) accounted for close to 70 per cent of flows to all developing countries. Another important observation is that, for a large number of host developing countries, one member of the Triad (European Community, Japan and the United States) usually from within the same region is the dominant source of foreign direct investment (figure 3). This pattern has become more pronounced in the late 1980s compared to the early 1980s, partly as a result of regional core network strategies of transnational corporations and regional integration initiatives at governmental levels. The Report provides an extensive review of recent policy development at the multilateral, regional, bilateral and national levels and examines their implications for foreign direct investment. At the multilateral level, the most significant developments regarding foreign direct investment took place in the context of the Uruguay Round. Alter almost five years of negotiations, the Director-General of GATT submitted a draft final Act embodying the results of negotiations including text on services, trade-related investment measures (TRIMs) and trade-related aspects of intellectual property rights (TRIPs) The Report provides the first analysis of the implications of these draft agreements for foreign direct investment. (ii) specific commitments, subject to negotiations, including market access and national treat ment. If and when adopted, the overall effect of GATS is likely to be in the direction of liberalizing foreign direct investment in services; it may also accelerate the liberalization process in other sectors. As regards TRIMs, the draft identifies a number of measures that are seen as inconsistent with existing GATT provisions. Those measures mostly concern performance requirements such as requirements for import substitution, domestic sales, trade balancing and local content. The dyaft on TRIMs, if adopted, is unlikely to have any significant impact on foreign direct investment flows, in part because most developing countries have already substantially liberalized their foreign direct investment regimes. The draft agreement on TRIPs is aimed principally at setting minimum standards for seven categories of intellectual property rights (copyright, trademarks, geographical indications, industrial designs, patents, lay-out designs of integrated circuits and trade secrets) and obligations of member Govenunents for enforcing those rights. It also sets up a multilateral procedure for the seulement of disputes between Governments. The impact of the agreement on foreign direct investment, if adopted, should be favourable, pardy through the reduction of disincentives to technology transfer and partly through the creation of a policy environnent more receptive to foreign direct investment. At the inter-regional level, the most important development was the endorsement by the OECD Council of Ministers in 1991 of the review of the Declaration on International Investment and Multinational Enterprises, originally adopted in 1976. The main changes approved related to strengthening the obligation of notification of measures contrary to the principle of national treatment, reinforcement of procedures to accelerate liberalization, and the expansion of provisions on the environment into a full chapter. At the bilateral level, the number of bilateral treaties for the promotion and protection of foreign direct investment continued to expand, reaching a total of 440 by mid-1991. As of mid-year, 19 new treaties had been concluded, mainly by Western countries with countries in Central and Eastern Europe and Latin America, the latter being a new development. At the national level, the liberalization of policies on foreign direct investment that had started in the 1980s accelerated in 1991. During that year, countries in Central and Eastern Europe liberalized their foreign direct investment regimes significantly. In the developing countries the pattern of liberalization initiated earlier was further intensified. There has also been an intensification in the privatization of state-owned enterprises in most countries. With active privatization programmes in more than 70 countries, the annual number of privatizations worldwide more than quintupled between 1985 and 1990, and the value of state enterprises sold reached over $185 billion by the end of the 1980s. The increasing importance of market forces-63 developing countries have liberal ized their trade policy regimes since the beginning of the Uruguay Round and some 30 developing and Central and Eastern European countries liberalized their foreign direct investment regimes in 1991 alone. Technology and the shrinking of economic space—in a number of industries, particularly service industries which have witnessed the most dramatic explosion in foreign direct investment during the decade of 1980s, access to powerful computer-communication networks, owned by single firms or a group of firms, is increasingly becoming the basis of international transactions. The globalization of industries-several key industries (for example, automobiles, electron ics) are becoming increasingly globalized, a process in which transnational corporations integrate, co-ordinate and control cross-border value-adding activities. The emerging services world economy-the new world economy is increasingly a services economy and since services are largely non-tradable (though tradability has been increased in some cases due to technological changes), foreign direct investment is typically crucial for access to efficient services. The regionalization of the world economy— transnational corporations are both reacting by way of developing strategic responses to regional integration arrangements and influencing the nature of such arrangements. Against the above background, the Report analyses the impact of transnational corporations on the growth of developing countries, focusing on five principal elements: capital formation, technology, human resources development, trade and environment. Capital formation remains an important contributor to economic growth in developing countries. Transnational corporations, as a major source of capital and a major charnel for transferring capital across borders, have a large potential contribution to make in stimulating growth in developing countries. Foreign direct investment as a share of domestic investment in host developing countries is not large, generally below 5 percent, although substantially higher in a few cases. Foreign direct investment as a share of domestic investment grew substantially in the 1980s in most countries, generally reflecting the growing importance of foreign direct investment, but in some countries reflecting stagnating domestic investment. However, even where foreign direct investment is a small share of gross domestic capital formation, it is usually much larger as a share of capital formation in industries that play a key hole in development, such as durable consumer goods or high technology manufacturing industries. An important example is the Republic of Korea. Thus, the importance of foreign direct investment is most likely understated by aggregate data. Transnational corporations appear to be important in industries in host developing countries that have higher profits and greater concentration dm the national averages. It remains an unanswered question whether the transnational corporations’ presence is a force for reducing competition, and therefore reducing efficiency, in these industries, or whether transnational corporations bring more efficient practices to industries that are already concentrated by virtue of cost and demand conditions. Transnational corporations stimulate local production through linkages with the domestic economy, an impact that bas proven quite important in several developing economies, such as Taiwan Province of China, although more limited in countries where local businesses have rot developed sufficiently to serve transnational corporations’ needs, as in Indonesia. On the whole, the evidence in the Report indicates that transnational corporations promote growth through a significant positive contribution to physical capital in developing countries, particularly in industries that are crucial to growth. Transnational corporations are major actors in the development of technologies. Research and development expenditures by the top 20 transnational corporations exceed those of France and the United Kingdom combined; United States and non-United States corporations together account for over 75 per cent of all patents granted in the United States during the 1980s, with foreign corporations accounting for over 50 per cent. Transnational corporations foster growth in developing countries through technology transfer. This is evidenced by die fact that foreign affiliates generally show higher factor productivity and that the share of high or medium research-intensive industries has generally increased in the affiliates’ total sales, manufacturing sales and manufactured exports. In some cases, transnational corporations have contributed to technology transfer and growth through local R&D by affiliates, stimulating technology development by local R&D institutions and spill-over impact on productive efficiency of host country enterprises. There is an increasing tendency among transnational corporations to internalize technologies among themselves through strategic alliances. Such alliances, most frequent in new technologies (bio-technology, information technologies and new materials), are heavily concentrated in developed countries, with developing countries accounting for less than five per cent. Thus the prospect of unbundling these technologies is very limited. The growth-promoting contribution of transnational corporations through technology transfer is heavily dependent on the state of development of local supplier industries, human resources, entrepreneurial capacity and incentive structures that promote competition through technology absorption. Host-country policies should be formulated to effect improvements in all these areas. An important aspect of human resources development is education and training. In the area of education, transnational corporations have a limited role to play in general education which is largely the domain of national governmental and other agencies. The same is generally true of formal vocational training, although there have been a number of instances where transnational corporations have collaborated with public educational agencies to establish and improve vocational training institutions in host developing countries. More importantly, transnational corporations provide vocational training to production workers in their affiliates. Most of the training is conducted to satisfy staffing requirements essential for the functioning of the enterprise, but it obviously has implications for the human resource pool of a host country. The training of unskilled and semi-skilled workers accounts for the bulk of transnational corporations’ training efforts in numerical terms; but qualitatively, and in terms of share of training expenditure, training of skilled workers is more significant. It is with respect to management capability that transnational corporations car make the greatest contribution to human resource development in host developing countries. Transnational corporations’ training in this respect encompasses the provision of technical knowhow, entrepreneurial abilities and management skills through formal, non-formal and informal channels of learning. A few large transnational corporations have established formal training programmes of their own. In addition, transnational business schools originating in industrialized countries have affiliates in several developing countries; furthermore, transnational corporations influence the curricula and teach-ing in these institutions. Non-formal learning is, however, the most important channel for the training provided by transnational corporations in management capabilities. It comprises directtraining of employees through short courses, assignments to the parent company, study travel; or deputation of trained personnel from the parent company. Career development within foreign affiliates further enhances the capabilities of employees. Training by transnational corporations is sometimes extended to employees of other firms and others in the labour force, motivated by considerations such as cost sharing, desire for contributing to the development of the host community, govemment incentives, or cooperation with international agencies. Training activities of transnational corporations also cover suppliers and local supporting industries. Non-formal training may also be provided to human resources in firms with which they have non-equity arrangements. Informal learning is a third charnel for training in management capabilities by transnational corporations and Cakes place through a process of socialization into the organizational culture of the transnational corporation. The resulting changes car be growth-promoting if they involve the transfer of values underlying particular managerial capabilities which are required for enhanced productivity and entrepreneurship. Host countries car strengthen the positive impact of transnational corporations on human resource development through their own policies relating to health, education and employment, as well as through policies affecting foreign direct investment and transnational corporation operations. Host countries can strengthen the contribution of transnational corporations to growth through human resources development by adopting conducive policies. They could pursue, to the extent feasible, policies and measures to transnational corporation investments in activities and forms that are mort relevant for acquiring knowledge and developing skills and managerial capabilities. They could, furthermore, establish legal or administrative requirements for the provision «training for employees by national firms as well as transnational corporations and by negotiating with specific transnational corporations for investments in human resource development. Transnational corporations have made a significant contribution to the growth of developing countries through improved export performance. The export propensity of United States affiliates in the manufacturing sector in developing countries increased from 22 per cent in 1982 to 33 per cent in 1989, and that of Japanese affiliates from 33 per cent to close to 40 per cent in the respective years. Transnational corporations have also contributed to a structural shift in developing countries exports in favour of technologically advanced products such as electrical and non-electrical machinery and transport equipment. · Apart front exports by production affiliates, developing countries’ exports have also been fostered by transnational corporations through non-equity links. In the case of Morocco, for example, subcontracting constitutes 20 to 25 per cent of total exports. Subcontracting has also facilitated growth in exports of technologically sophisticated products such as computer parts, semi-conductor and aircraft components from several countries in Asia. Imports by both marketing and production affiliates are important sources of access to critical intermediate and capital goods. In order to strengthen transnational corporations’ contribution to the growth of developing countries, it is necessary to improve co-ordination between trade and foreign direct investment policies in developing countries, ensure unrestricted access to their exports in the international market and adopt policies that promote competitive spirit among both domestic and foreign enterprises. Transnational corporations are extensively involved in environmentally significant activities. For instance, they are thé primary producers and intermediate consumers of chlorofluorocarbons, which are the principal cause of ozone depletion, and have extensive involvement in most pollution- and hazard-intensive industries, as measured by environmental control costs. They also tend to be more mobile and to have greater discretion in the location of production than domestic firms. At the same time, transnational corporations tend to give rise to higher expectations and have the potential to assume a leadership role in environmental protection because of their financial, managerial and technological strength; the latter includes access to clean tech nologies and pollution-abatement technology. At a general level, the growing share of the services sector in the foreign direct investment stock of major home countries suggests a decreasing environmental impact of foreign direct investment, since service activities involve (with some notable exceptions) less environ-mental degradation than primary and secondary production. Within the industrial sectors, no clear trend emerges from available data as to the share of pollution-intensive industries in total foreign direct investment in either developed or developing countries. Studies on the location of pollution-intensive foreign direct investment by transnational corporations do not support the hypothesis that differences in cost of environmental control or in national standards are a major determinant of industrial relocation by transnational corporations. The general impression is that, because of their visibility, resources, and access to clean technology, large transnational corporations may have better environmental records than local firms in host countries, and that they may be more interested in environmental protection than their local joint venture partners or small and medium size fines, whether foreign or local. Some studies on Asian host countries found that, although transnational corporations adopted lower environmental standards in their developing-country operations than in developed ones, they maintained a better track record than local firms. Evidence from the UNCTC Benchmark Survey also suggests that the largest firms were more likely to have environmental, health and safety programmes; that transnational firms with a vice-president for environment , health and safety (generally the larger fines) devoted more time to environmental policy tasks in their foreign operations; and that attention to environmental policy tasks was also positively related to the site of environmental staff, a proxy for transnational corporation size. The actual and potential influence of transnational corporations on various aspects of environmental quality and hence on sustainable growth in host countries raises a number of policy implications. The main task is to devise a framework within which market-based solutions can be pursued, encouraging approaches that compensate for market failures and provide an incentive for transnational corporations (as well as other firms) to engage in socially efficient production and to reorient technology and product development towards sustainable growth. National policies have a crucial role to play. In general, the responsibilities of Govemments are fourfold: to eliminate subsidies to naturel resource users that encourage overuse and abuse; to internalize externalities through market reform (including appropriate combinations of pollution taxes and abatement-subsidy schemes); to establish effluent and emission standards; and to institutionalize a liability and compensation system. While national policies in host countries have the most important role to play in ensuring that investments by transnational corporations are environmentally sustainable, home country policier can also contribute to that end. Homecountry Governments that encourage and assist foreign direct investment can take the environmental aspects of an investment into account. Regardless of the regulatory framework, transnational corporations undertake environmental protection in their self-interest. Many fines have adopted policier for managing corporate growth in an environmentally safe and sustainable manner, although much remains to be done. In addition to firm-level measures, transnational corporations have also cooperated internationally, including through the adoption of common guidelines and codes for environmental protection. Transnational corporations deliver a package of assets to host economies, some tangible (such as new investment), others intangible (such as improved organizational practices) and those assets interact with each other in many ways. By linking together the various elements that determine growth, transnational corporations can contrebute to a virtuous cycle of investment, technological progress, human resources development and environmental quality which, together, stimulate economic growth (figure 4). Thus, the overall impact of growth may be greater than the sum of the individual effects. In addition to the direct impact, transnational corporations can also enhance the growth stimulus indirectly through interactive effects on unrelated domestic firms. For instance, foreign affiliates can force domestic fines to compete more actively in both domestic and international markets, which in turn could encourage product innovation, process improvements, upgrading of the labour force and new investments by domestic firms. · The World Investrnent Report 1992 also notes that some qualifications should be taken into account in assessing the contribution of transnational corporations to growth. First, the growth impact may bc greater for middle – and high-income developing countries than for low-income countries. This is not only because low-income countries receive very little foreign direct investment, but also because the key requirements for growth in those countries-raising agricultural productivity, improving basic infrastructures and increasing the educational and nutritional standards–tend to be marginal to the activities of transnational corporations. Thus, a threshold level of domestic development may be a precondition for benefiting most from the potential for greater growth that transnational corporations can create. Second, there may be circumstances in which transnational corporation activities may not contribute to sustained long-term growth, although output may rise in the short run. For example, transfer pricing may reduce thepotential for growth through trade. Similarly, abuse of market powerby transnational corporations car stifle the growth of local entrepreneurs. Here again, the higher the level of a host country’s development, the mater is the likelihood that the host country would be able to neutralize such adverse impact. Based on the analysis of rising importance of foreign direct investment, the fundamental structural changes in national economies and the international economic environnent which define the new context for growth and the actual and potential contributions of transnational corporations to growth in their quantitative as well as qualitative dimensions, the World Investment Report 1992 calls for several new policy approaches in both international and national domains. Policy discussions in international forums have been historically attuned towards looking at the world through the prism of trade, rather than foreign direct investment. The discussion on tracte-related investment measures (TRIMs) is a major example of this approach in which the focus is on investment measures as they distort trade flows. But in a world increasingly characterized by a symbiotic relationship between trade and foreign direct investment, both policy analysis and political negotiations could be better served by an equal emphasis on the examination of the impact of trade and other policy measures on investment flows. One step in the above direction could be to institute a voluntary system of multilateral review of national policies that affect foreign direct investment in much the same way as GATT reviews trade policies. The objective would rot merely be an evaluation of the policy framework, but also the provision of assistance in the design of policies that are most efficient from the point of view of national and global welfare. In a world of rising importance of foreign direct investment, the failure of a transnational corporation may adversely affect a large number of stakeholders in many countries-the state, shareholders, creditors, suppliers and contractors, employees and consumers. This has been amply demonstrated by recent failures of the Bank of Credit and Commerce International (BCCI) and the Maxwell Communications Corporation. National bankruptcy laws are inadequate to deal equitably with affected parties in multiple jurisdictions. The WorId Investment Report 1992 suggests some possible cooperative approaches in this respect. The distribution of foreign direct investment remains highly uneven despite bold policy changes in many developing countries to attract foreign direct investment. Serious consideration should, therefore, be given to the establishment of a multilateral foreign direct investment facility as a tripartite venture between host and home countries and transnational corporations with a view to alleviating the persistent imbalance in foreign direct investment flows. In the context of national policies, the World Investment Report 1992 examines the desirability of strategic interventions in the area of foreign direct investment, usually implemented through investment incentives and performance requirements and/or restrictions on foreign direct investment, with a view to increasing some perceived long term benefits or ensuring local control on grounds of national security or economic sovereignty. The overall conclusion is that such interventions should be highly selective and based on a very careful assessment of cons and benefits. Finally, the World Investment Report 1992 suggests the need for increasing international transparency of national foreign direct investment policies which could be of great use to transnational corporations and home countries as well as host countries in their efforts to attract foreign direct investment. One way of increasing such transparency would be for an international agency to compile and publish, in close cooperation with national governments and other interested parties, an authoritative publication, by country, on the policies, laws, regulations and administrative guidelines that bear directly on the activities of transnational corporations. The World Investment Report postulates that competition among nations will increasingly be based on domestic rather than military prowess. And the nature of international competition will be redefined by the globalization of economic activities of transnational corporations which car be increasingly viewed as networks of international production in which intra-firm flows of capital, goods, services, training and technology play an important role, and their major value adding function is the integration, organization and management of those international flows. The emerging shape of international production poses new challenges to policy makers. These concern, inter alia, the relative role of the market and the state, the yole of foreign direct investment in a country’s development and its integration with the international economy and the interface between domestic policy issues and their international dimensions. Many countries may become increasingly specialized in particular stages of an industry as transnational corporations organize international production. Thus, individual countries may become constrained in their ability to develop independent industries dominated by national firms. National policies regarding industrial and services sector development, trade and technology will have to take into account the global nature of many Industries and policies of other countries in these industries. The logic of the emerging international production system weakens national policies in their ability to regulate national economic activities and dictates that many policies may shift progressively from the national to the international domain. These include, in particular, competition policy and corporate law, investment incentives and technology policy, but also industrial, labour and services policies. A multilateral approach will be required to avoid frictions resulting from national approaches to economic management. A multilateral approach will also be required to deal with the inherent tension between an increasing globalization of the world economy and simultaneous regionalization with a view to ensuring that the development of an efficient, open and fair international system is not constrained by regional groupings. Another key issue that will have to be addressed multilaterally is to what extent the emerging patterns of regionalization and international production pose the threat that many developing countries become marginalized because of their non-inclusion in regional groupings or in the globalization strategies of transnational corporations. The above considerations underline the need for looking at international transactions from the perspective of foreign direct investment. This constitues a major change in the traditional paradigms of international economic relations focused on trade and finance. What is more, there is a growing need to arrive at an international governance framework for international production. One possibility would be to elaborate international principles and standards and to consolidate them in a global, comprehensive and balanced instrument with a view to ensuring the stability, predictability and transparency of the international investment environment, which would have to deal with the main aspects of the treatment of transnational corporations by Governments as well as issues related to the behaviour of transnational corporations. Another possibility would be to establish an international framework focusing on global competition and restrictive business practices, either through a web of bilateral arrangements or multilateral negotiations. Such a framework becomes all the more important as fines and industries globalize, thus underlining the need to safeguard competition. However, the issues outlined earlier point to the need for a more far-reaching framework to meet the challenges of globalization. Specifically, an institution may be needed that would bring the principal forms of international economic transactions and their interactions within its purview. The mandate of such an institution would have to be more comprehensive than that of existing multilateral institutions.